View More In Building Supplies. The built-in 18650 lithium-ion rechargeable batteries (6000mAh) allows for quick and convenient USB charging, saving trouble from frequent battery replacement. The lamp body also comes with USB output port (5V 1A), and can serve a power bank for your smartphone or other mobile devices in emergency. The light has 3 lighting modes: High brightness (of 1700lm daylight white), low brightness (of 400lm daylight white), and red flash, meeting your different needs. Comes with IP44 waterproof rating meaning it can be protected against splashing water from all angles, suitable for indoor or outdoor environment, like a rainy day. 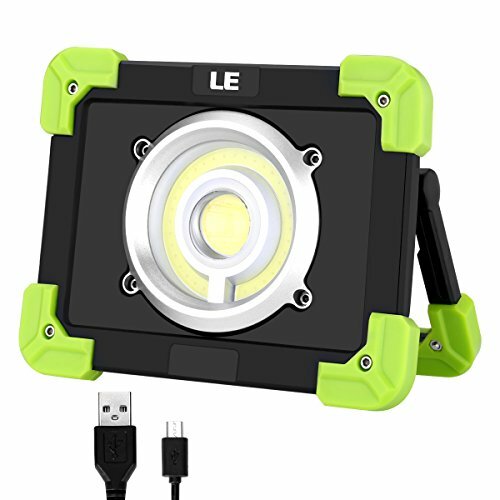 The light is equipped with a flexible support handle, and you can handle it for working, hiking, camping, hunting, exploring, and searching etc. Only high end LED and advanced optical design are adopted. Enjoy lighting with LE. USB Rechargeable: The built-in lithium-ion rechargeable battery with equipped USB cable allows for quick and convenient charging. 3 Modes: Full brightness (of 1700lm daylight white), half brightness (of 400lm daylight white), and red flash. Water Resistance: IP44 waterproof rating, no harm from water splashing from all angles, suitable for indoor or outdoor environment. Power Bank: Serve as a convenient power bank for charging your phone and other devices in emergency. Widely Use: Perfect for outdoor activities like working, hiking, camping, hunting, exploring, searching and so on. If you have any questions about this product by Lighting EVER, contact us by completing and submitting the form below. If you are looking for a specif part number, please include it with your message.